Mortensen stars as Frank T. Hopkins, a real-life horseman and alleged hero who claimed to be, among other things, a U.S. Cavalry dispatch rider, a star of Buffalo Bill's Wild West Show, an endurance rider of legendary accomplishment - and the son of a Cavalry scout who miraculously survived the Little Big Horn massacre. At first glance, the character might seem worlds away from Aragorn, the stoic warrior Mortensen played so memorably in Peter Jackson's films of J.R.R. Tolkien's fantastical novels. But the actor suggests that differences between the two roles may be more apparent than real. 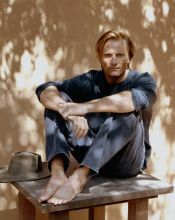 "To be honest with you," Mortensen says during an afternoon of thoughtful conversation, "Aragorn reminded me a lot of the Western characters I'd seen Gary Cooper play - his way of reacting to certain circumstances and thinking before he acted. 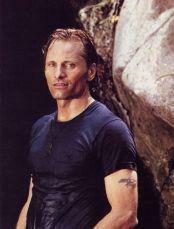 Also, Aragorn had a certain code of honor that's not unfamiliar if you've looked at Westerns. Hidalgo introduces Hopkins by noting his celebrated triumphs as an endurance rider - including, most famously, his victory in an 1886 long-distance race from Galveston, Texas, to Rutland, Vermont - and detailing his brief career as a star attraction in Buffalo Bill's traveling revue. But these adventures serve merely as prologue to Hopkins' death-defying exploits during the 1890 running of the Oceans of Fire race along the gulf of Syria. At the behest of a sheik (Omar Sharif) with a penchant for high-stakes wagering, Hopkins agrees to test Hidalgo, his favorite Mustang, against more than 100 desert-bred steeds in a 3,000-mile run for fame and fortune. For nearly 10 weeks, the American cowboy and his pinto stallion endure broiling heat and occasional sandstorms, often going for one or two days without water. Near the end, Hopkins seriously wonders whether the finish line will ever be more than a taunting mirage. "It's not your usual Western," Mortensen says, "in the sense that most of the action takes place in the Arabian Desert. But like many Westerns - like many stories from many different cultures - it's a hero's journey, a classic hero's story. In other words, Mortensen says, it's about how a character is formed in a very stressful situation, which is ultimately even more important than whether he achieves the goal or survives the journey. Those kinds of stories have always interested him, as does the opportunity to portray a character who transcends physical limitations and burdensome self-doubt. As Frank T. Hopkins, Mortensen felt he could ultimately appear every bit as heroic as any larger-than-life adventurer in the wilds of Middle Earth. Even before the first chapter of the Lord of the Rings trilogy thundered into theaters in 2001, Mortensen was branded a hot property by Hollywood decision makers. He made his movie debut as a minor character in 1985's Witness, then served his apprenticeship as a mostly anonymous supporting player in movies as diverse as Young Guns II (his only other Western credit) and The Young Americans (an underrated British-produced crime drama that went the direct-to-video route in America). In 1991, he earned praise from critics for his breakthrough performance as the violently hotheaded brother of a Nebraska highway patrolman in Sean Penn's The Indian Runner. Mainstream audiences were equally impressed with his magnetic screen presence - and, quite often, his smoldering-hunk sensuality - in The Portrait of a Lady (1996), G.I. Jane (1997), A Perfect Murder (1998), and 28 Days (2000). And as soon as the masses started swooning while he swung a terribly swift sword as Aragorn, Mortensen's employment opportunities increased exponentially. Even so, director Joe Johnston (October Sky) had little trouble talking him into signing on for the rigors of Hidalgo - a movie that required months of location shooting in Morocco, California, the Black Hills National Forest in South Dakota, and the Blackfoot Indian Reservation in Montana - once Mortensen read what he describes as the "terrific script" by John Fusco (who, perhaps not coincidentally, also wrote Young Guns II). "I've always liked adventure stories," Mortensen says, "because they're filled with risk and danger. And I like horses. And I'm fascinated by that period, the late 19th century. It's a really interesting period - throughout the entire world, of course, but especially in America. It was a time of great transition that really marked the end of the frontier in a way, the end of the Wild West. And it marked the beginning of a time when America started looking outward at the rest of the world and thinking about its place in the world. It was a pivotal time in history - after the Civil War, before World War I, just before the Spanish-American War - one that gets Mortensen's imagination going. "I've always wondered what it might be like to eavesdrop on a period like that and glimpse those historical events," he says. It's not just the history he'd like to see, but also the birth of a myth. And not just the myth of the West, but the myth of America. Mortensen is among the first to admit that oft-told stories about the adventures of Frank T. Hopkins are, at best, dubious. At worst, the tall tales are complete fabrications. Historians and researchers have devoted copious amounts of time and energy to books, articles, and websites that debunk many of Hopkins' more fanciful claims. According to them, Hopkins wasn't born in a log cabin near Fort Laramie, Wyoming, as he often claimed, and he didn't live among the Lakota Indians, star in Buffalo Bill's Wild West Show, or even ride in the Oceans of Fire race. Indeed, some of the most iconoclastic critics make the claim that, in all likelihood, Hopkins never even left the United States. In Mortensen's view, though, none of that really matters. "I think [writer] John Fusco found a way, along with [director] Joe Johnston, of going along with certain tall-tale aspects of the story while at the same time touching on real events," Mortensen says. "As many historians and equine experts have pointed out, Hopkins was in many ways ahead of his time in terms of his training methods, especially for long-distance races. And his faith in the Mustang breed - in the hardiness, the endurance, all the qualities of that particular strain - all of that has been borne out." But what about the accusations of self-mythologizing? Mortensen also paid close attention to the finer details of props and costumes, body language, and speech patterns to transform himself persuasively into a late-19th-century cowboy. "As far as I was allowed to, I tried to ensure that the details were true to what somebody like this would have used back then," Mortensen says. For inspiration, he looked to a classic Western directed by Howard Hawks. "Look at a movie like Red River, in which you have two very different kinds of actors, John Wayne and Montgomery Clift, working really well together," he says. "Montgomery Clift was certainly not someone with a background in Westerns. He was a very urban person. But he was athletic enough - and, more than anything, determined enough - to get it right. Mortensen promises that he's not borrowing a page from Frank T. Hopkins' playbook for self-promotion when he reveals a personal reason why he wanted to appear in Hidalgo - or in any Western in which Buffalo Bill Cody might figure into the plot. "I found out a while back that I'm related to Buffalo Bill - distantly, on my mother's mother's side of the family," he says. "It's true: I went to the Buffalo Bill Historical Center in Cody, Wyoming, and saw the records that prove the connection." Mortensen finds J.K. Simmons' performance as Buffalo Bill "terrific" - and it gave him an interesting opportunity to play in scenes with a distant relative. The same thing has happened in movies, Mortensen says. "If you know anything about the way people in the Old West really lived, if you know what was practical clothing for a cowboy - as opposed to what he might put on for show for a photograph or the way a photographer might dress up an Indian for a more dramatic image - you look at many of the early Western movies and you say, 'Well, a lot of this is hooey.' This sort of thing was carried on in movies until the 1940s and 1950s, until people started making more of an effort at realism and getting it right. Mortensen sees that hybrid of true-to-life and larger-than-life carrying over all the way from Buffalo Bill to Hidalgo. Out of that mix, he believes, comes an honest portrait of an American archetype. Out of that mix, he believes, comes an honest portrait of an American archetype. During the often arduous filming of Hidalgo on location in Morocco, Viggo Mortensen and Omar Sharif developed a mutual admiration society. And both actors feel their off-screen bonding greatly enhanced the relationship between their on-screen characters. "It's so important when you're making a film to get along with your partner," Sharif says. 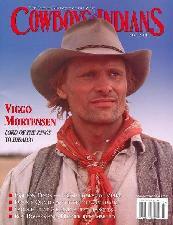 "And I must say, I found Viggo Mortensen to be a very quiet, very gentle person. I know he's becoming a very big star, but he is not at all bigheaded or somebody who thinks he's everything in the world. He even gave me copies of books he's written, with poetry and photographs, and signed them for me. We got along so well because he was so charming and nice." Charming, nice - and, Mortensen admits, frankly starstruck. "Not only was I working with this wonderful actor I knew best from Lawrence of Arabia - we were working in some of the same locations in Morocco where they shot parts of that movie 40 years ago. That was an amazing experience for me," Mortensen says. "I mean, to be working there with the man himself, Omar Sharif, was great just in terms of being a witness to film history. "But it was even better to get to know that man as a human being. He's a very generous, extremely professional actor. It doesn't take more than a few minutes to tell that he's also a genuinely intelligent, well-read person. And he's got this aura about him that's beyond anything a lighting designer or a cameraman can do. He just has a certain gleam in his eye ... and that smile of his. He's so in the moment and so alive. He just radiates a love of life." Mortensen wishes they'd had even more scenes together. "But I think the relationship between our two characters is a good one, a unique one. It shows how two very different cultures can connect."